I've had a cheap, crappy bike for a while now and so far it has served me fairly well. It is not in great condition and has its problems but generally works despite my recent fitness kick which has seen me taking my son out for morning rides before work in the trailer which hangs off the rear axle. 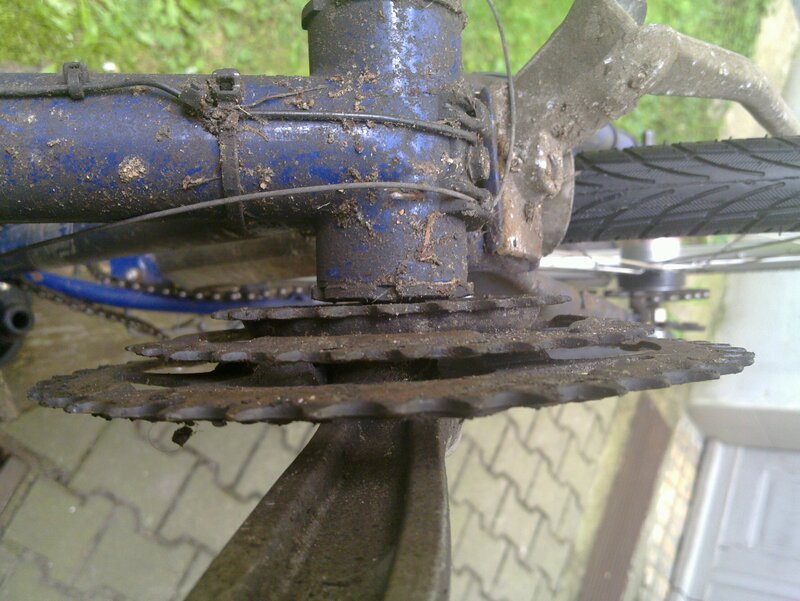 The additional weight of course puts a strain on the axle and gears (not to mention ME) and the already warped gears and chainrings started to complain about it. The chain started skipping off the rear sprockets more and more regularly despite my efforts to adjust the rear derailleur. So, never the one to shy away from a bit of do-it-yourself modification work I decided to investigate replacing the gears. Berlin is fairly flat and with three front chainrings and seven sprockets on the rear cassette I was amply supplied with gear overkill. I had looked into the Shimano Nexus internal hub series and the Nexus3 had taken my fancy so I ordered what I thought were the parts I required from a shop selling their stuff on Ebay, and began the process. Removing the chain, which is made pretty easy by the derailleur. Removing the rear derailleur which just requires one hex bolt to be taken out. Removing the nuts and washers securing the rear wheel. Loosening the rear brakes. There is a shortcut here which I didn't realise before - you can just slide the "spaghetti" tube out of one side of the brakes to loosen them completely. I'd been loosening the cable instead all the previous times. Cutting the unneeded shifter cable to the back derailleur and removing related garbage. Removing the front derailleur, cabling etc as well since I was only going to use a single chain-ring up front after the modification. Removing the actual rear wheel. 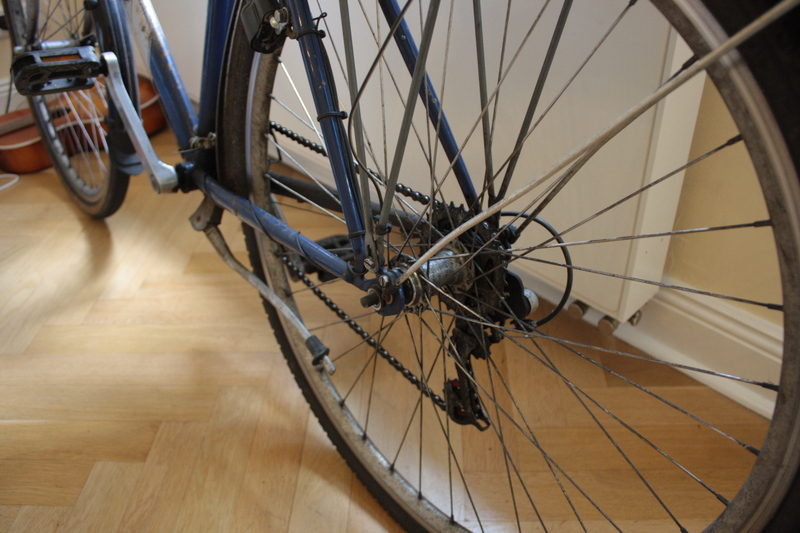 Rear wheel with internal gear hub. Shortly after these parts arrived I realised I was missing most of the rest of the rear wheel assembly, most noticeably the sprocket. So I ordered that part as well from the same place, hoping that was all I needed. Not so. There are a bunch of other washers, rings, fasteners and the funny little pin that goes into the hub as part of the shifting mechanism which you can see sticking out in the photo above. Apparently there is a kit that contains all of these additional parts (Schaltungszubehör) but I could not source it easily here, nor did any of the shops I visited have it. By the time I had taken the above picture I had received parts ordered from two stores on Ebay, some of the accessories from a bike shop on Prenzlauer Allee (after fruitlessly checking two other local shops) and a new tyre and inner tube from Stadler (an absolutely massive bike shop just next to Storkower Straße S-Bahn). I also had an incorrect accessories bag which suits an SRAM seven gear internal hub. Huzzah! I've tried to take a frugal approach to this bike wherever possible, applying the "if it ain't broke don't fix it" mentality reasonably successfully. So I was slightly torn when I was getting the rear sprocket properly attached at bike shop #3 and the guy asked if I needed a chain. I initially said no, then decided I should get a new one in case the old one was too stretched. 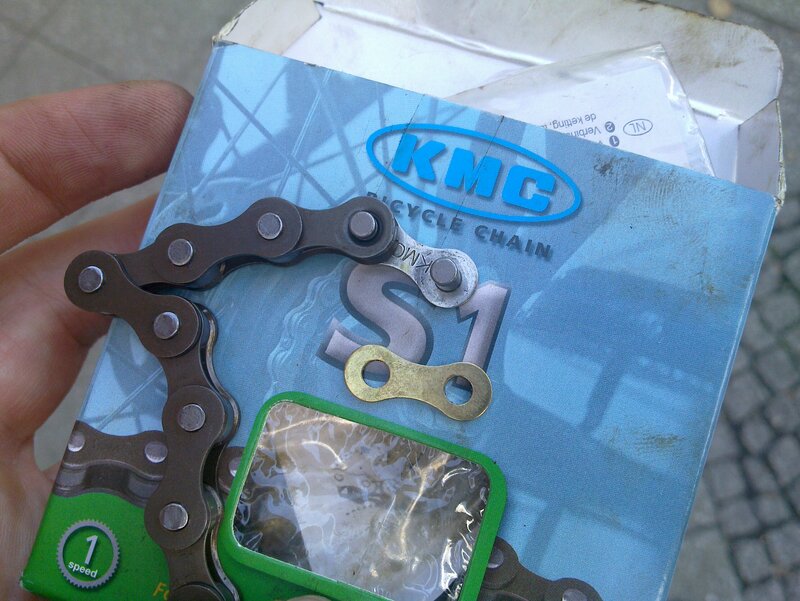 As you can see, the old one is completely the incorrect type for the new sprocket so it would have been a total failure and required yet another trip out for the chain. A word of caution - don't perform bike surgery over an open drain outside. My first snap lock chain link dropped out of my fingers and into the drain below almost immediately and I was forced to make a stop at bike shop #5 right before it closed on a Saturday (and none are open on Sundays). 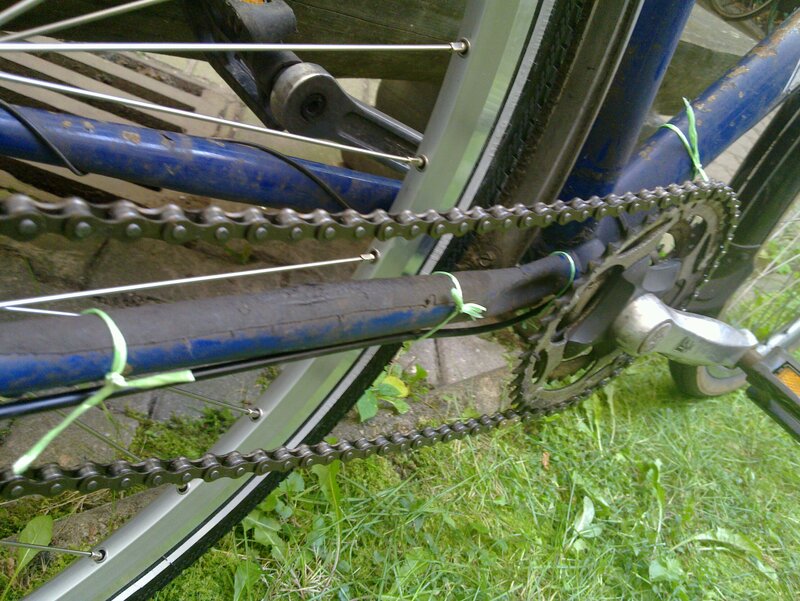 Aside from that, these links are invaluable if you need to mess about with your chain, while finding the best length. Take it slowly and don't remove too many links at once! Test before taking out more, as it is almost impossible to reattach links using the regular tool. Here are the bad boy front chainrings. 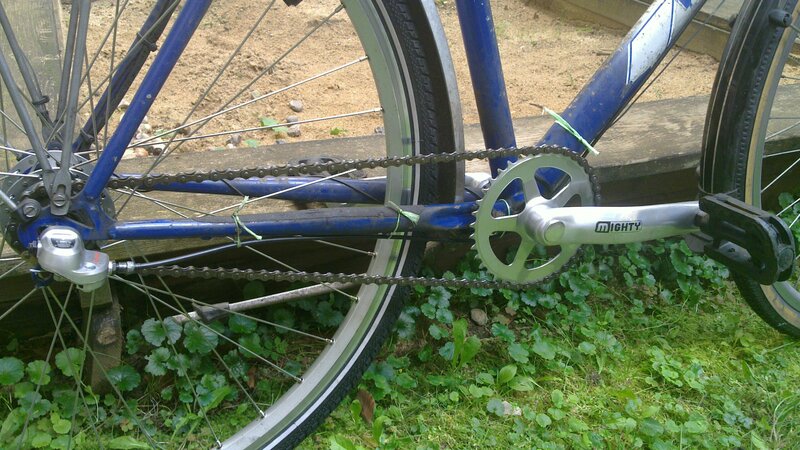 The initial plan was to use the largest (which I believe was something like 42 teeth), although the angle from it to the rear sprocket was significant and I wasn't interested in doing funny chainring surgery to reduce the angle. 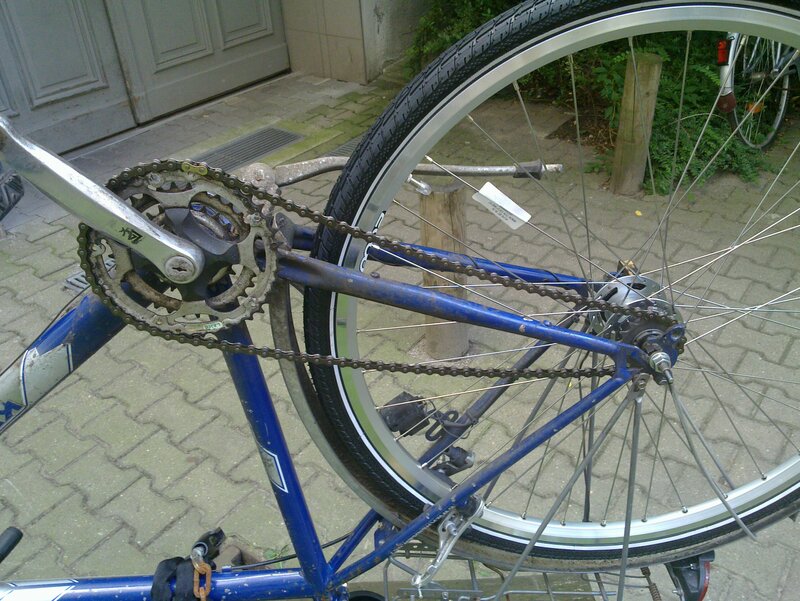 After the initial chain shortening and connection, here is the first working example of the drive train post-modification. 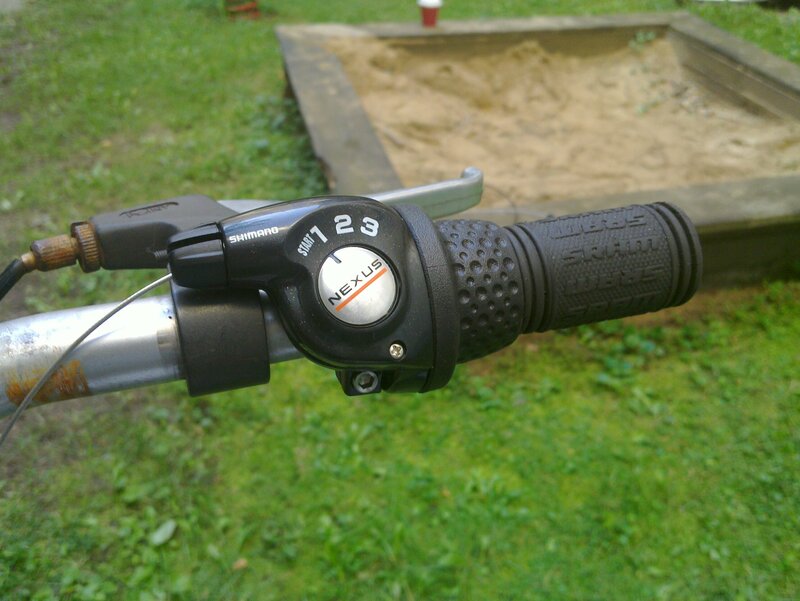 The shifter was pretty easy to install and fit in reasonably well with the existing half-length handlebar grip, although it is a little short now. The exit point of the cable is also a bit irritating as it gets in the way of the bell. But it works. Here is my ghetto shifter cable installation with synthetic string. Hey, it was only temporary. Shortly after putting the bike back together, I took it for a test ride and the chain slipped off almost immediately after putting a bit of load on it. 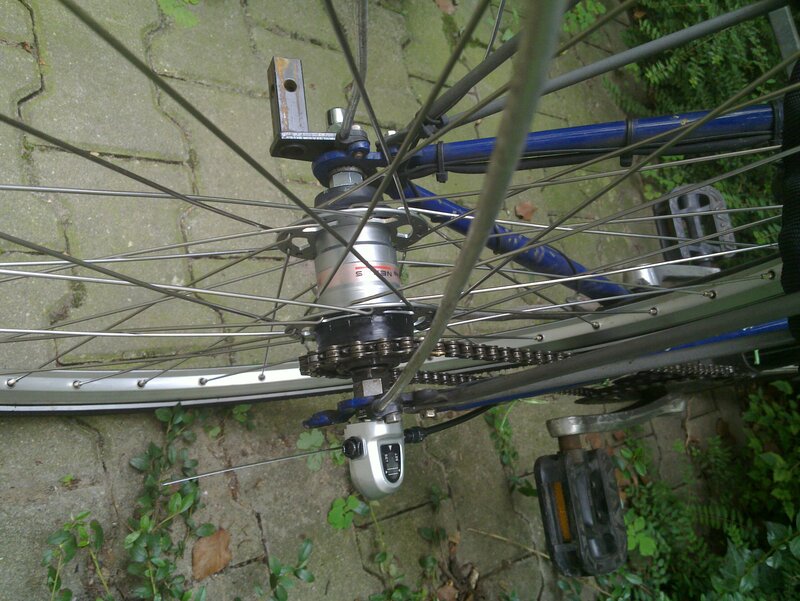 I assumed that the problem was the angle between the front chainring and rear sprocket so I moved the chain to the middle chainring and shortened it again. This seemed to fix the problem at least for just myself riding the bike at reasonable speeds and in all three gears. 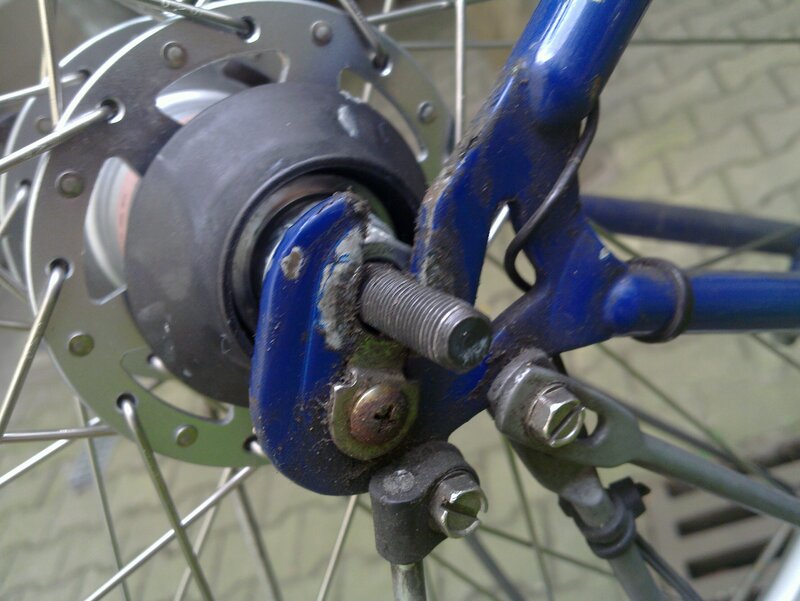 Here is a different view of the rear hub and shifter mechanism attached. It just houses a small lever that is pushed and pulled by the shifter cable. In turn, it pushes on the pin that goes into the hub and causes the gear changes in three different pin positions (depths). After taking the bike for a real ride with trailer attached, the chain got progressively looser and looser until it started skipping, and by only 5km I was getting rather nervous about it. I turned back but by 9km it jumped off and I had to coast home. 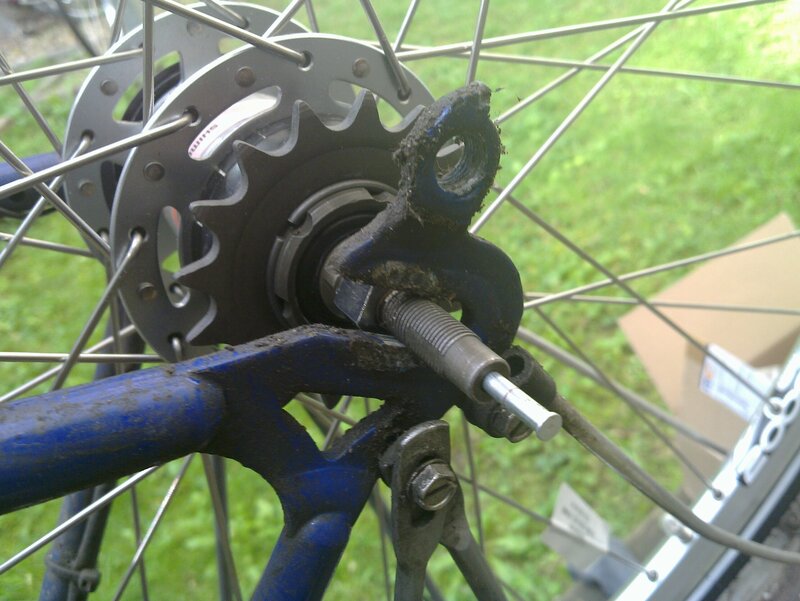 The axle on the chain side had obviously moved out of the dropout slighltly, so I had either under-tightened the nuts or not had enough locking washers or nuts or both. 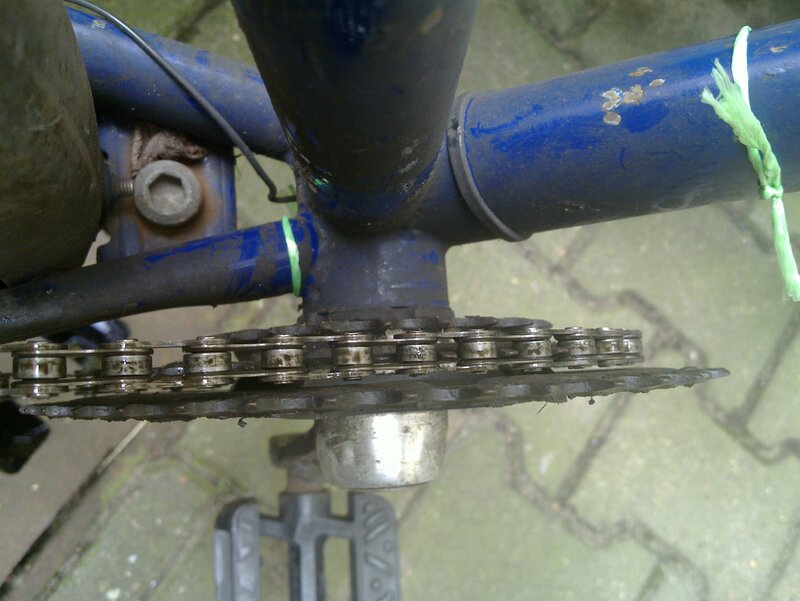 I also suspected the front chainrings to be slightly warped (as the rear cassette had been before) which didn't help. At this stage I had not been able to ride for about two weeks so I had run out of patience. I took the bike to my local shop (literally 100m away) and asked them to fix whatever was wrong. They tightened up the axle and replaced the front chainrings with what you see pictured, a single 38 tooth ring and new crank arms. As a bonus whatever they did fixed the noisy bearings in bottom bracket and my pedals don't wobble about as they used to. The end result was extremely good. The combination of 38 teeth in front and 16 in rear give me a very good set of ratios between the three gears - 48.7, 66.5 and 90.7 gear inches respectively. Even with the trailer they work very well for the local terrain. I would not do it the same way again but I don't regret anything about the upgrade. Before you do anything, read Sheldon Brown's excellent site. Find the most well-stocked bike shop in your city and go there. Tell them what you want to do to your bike and just get them to supply all the required parts in one hit. It is much better than having to find out for yourself that you are missing one obscure part that nobody carries. Get the right tools to do the job, and make sure they are high quality (this goes for just about anything mechanical). 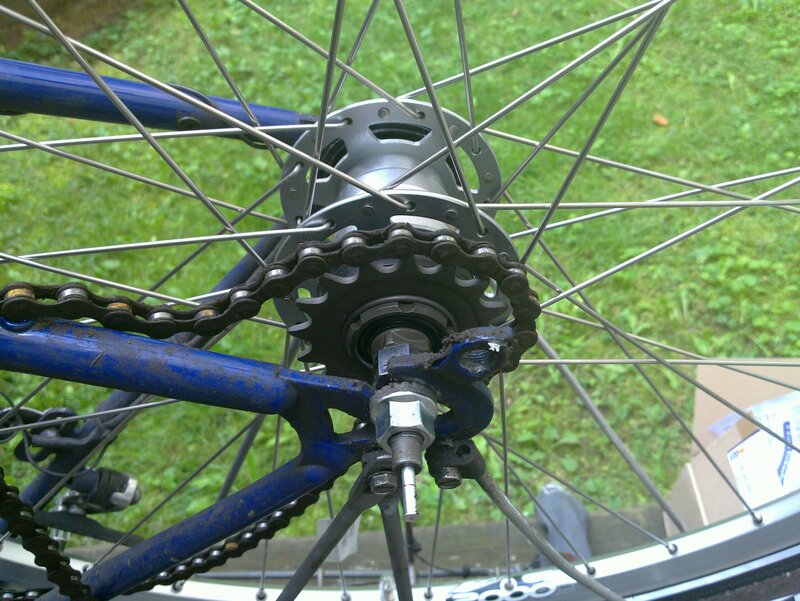 Pester your friends with bicycle repair knowledge and mine it. Allow plenty of time! If you will go crazy if you can't ride for more than a couple of days, make doubly sure you can get it all done, or you have a rollback plan (or better yet, another bike). If you have done similar upgrades, please leave a comment as I'd love to know what you did and how you got on.